The votes are in! This year’s most Ludicrous New Jersey Lawsuit is the dispute over whether Walmart should be liable because a gas can it sold exploded when someone tried to start a fire with it. Which Lawsuit Will Be Named New Jersey’s Most Ludicrous Lawsuit of 2016? A lot of ridiculous lawsuits were filed in New Jersey this year, but only one can be crowned 2015’s Most Ludicrous Lawsuit. This year, the esteemed honor goes to the man who tried to sue Applebee’s because his fajitas were too hot to pray over. The American Tort Reform Association has released its annual “Judicial Hellholes” report, and New Jersey is once again recognized as a state on the brink of becoming a litigation hot spot. ATRA notes that our state’s consumer protection laws are far from mainstream, and our court system is becoming hostile to arbitration agreements, in direct contravention of federal law. The New Jersey Supreme Court has today released its opinion in the interesting medical malpractice case, DeMarco v. Stoddard. The 5-2 majority opinion overturned an Appellate Division decision that had treated medical malpractice insurance like auto insurance, and reaffirmed the court’s commitment to applying the law as written. 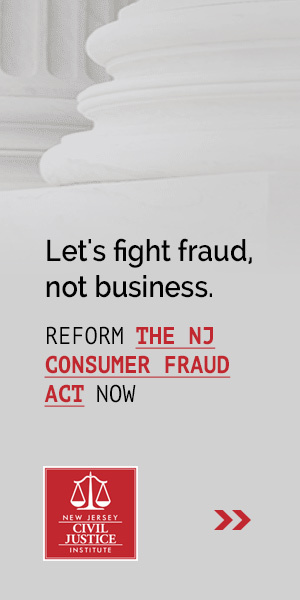 What’s the Impact of New Jersey’s Decision to Outsource Regulatory Enforcement? On Friday, September 18, the New Jersey Civil Justice Institute is hosting a half day conference on New Jersey’s policy of outsourcing the enforcement of many business regulations to private attorneys. Outsourcing Enforcement? The Debate Over Privatizing the Role of Public Enforcement, is being held from 8:00-1:30 at the Hotel Woodbridge at Metropark. Many law-makers, business leaders, and attorneys will be in attendance. This morning, the U.S. Chamber of Commerce’s Institute for Legal Reform released its latest survey of state legal climates. New Jersey’s ranking fell to 38 this year, down from 32 in 2012 when the survey was last updated. This morning the Appellate Division issued an important ruling in the ongoing litigation over Hoffmann-La Roche Ltd.’s acne medication Accutane. The ruling brings to a close a case that has been bogging down the court system for over a decade, and sends a clear message that some choice of law questions are no longer open for debate. This morning Senate Budget and Appropriations Committee is holding a hearing on a bill that would raise taxes on companies and individuals that have been ordered to pay punitive damages. “There’s a reason no other states have a tax like this – it’s a terrible idea,” said Marcus Rayner, President of the New Jersey Civil Justice Institute.